Betty, the gorilla, goes ape when the banana she wants to eat won’t open. Her tantrum is as massive as her size and she has to calm down before Toucan can help her by unpeeling the tasty snack. But, unable to deal with being robbed of unpeeling it herself, Betty has another fit, this time louder than the last, followed by another at the prospect of losing the banana to Toucan. It’s all ‘Terrrible Twos’ behaviour and the two and three-year-olds with whom I tested this book were enthralled, loving the sound effects of a toddler gorilla out of control. 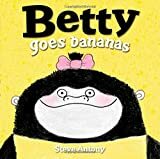 They knew, without explanation, that the ending where Gorilla finds another banana is the beginning of her self-help discovery and path to less frustrated response to problem solving. Original, funny comic drawings, spare in colour and bold in line, are a perfect accompaniment to this tale demonstrating the need to re-channel a temper into action.